Although it was originally created in France, doria is now found almost exclusively in Japan. It's basically a rice gratin; rice is either flavoured or topped with other ingredients such as bolognese sauce or sauteed prawns, covered in white sauce and cheese and then grilled. 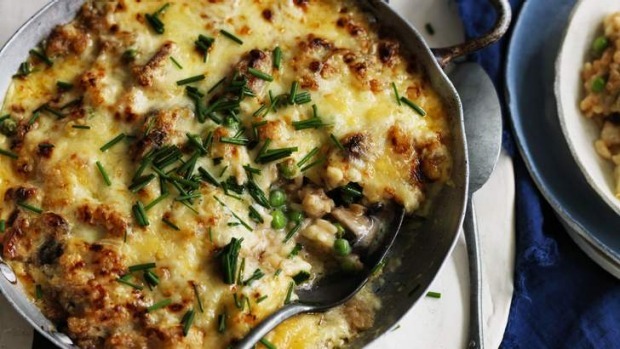 It may sound strange, but this chicken version is a little bit like a fried rice lasagne. 1. Heat the oil in a large wok over high heat. Add the chicken and fry until lightly browned. Add the onion, mushrooms and peas and toss until the onions and mushrooms are softened. Add the rice, salt, soy sauce and tomato sauce and toss for about five minutes until the rice is coated and fragrant. 2. For the white sauce, place the clove-studded onion, bay leaf and milk in a small saucepan and bring to a simmer, watching that it doesn't boil over. Remove from the heat. In a separate saucepan over medium heat stir together the butter and flour, and gradually add the milk while stirring to a smooth sauce. Season with salt, remove from the heat and stir through the egg yolk and nutmeg. 3. To assemble the doria, place the rice into a gratin or baking dish and cover with a thick layer of the white sauce. Scatter the sauce with cheese and grill under an overhead grill until the cheese is browned and bubbling. Top with chives and serve.